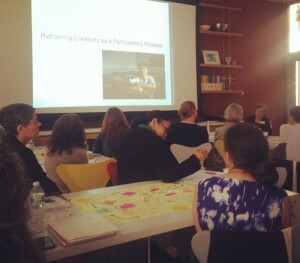 Guided by the question of how can we foster creative capacity in our children?, the Sam Francis Foundation recently hosted a roundtable discussion at the Isabella Stewart Gardner Museum to surface new perspectives on nurturing creativity in learning. Although some familiar themes emerged in our conversation—the importance of material resources, access to mentorship, and the necessity of safe spaces in which to create—one aspect brought to light was especially compelling: participatory creativity. Maintaining an individual orientation towards creativity is harmful to young people in a few different ways. First, it suggests that some people are more or less creative than others, or that some people are creative whereas other people aren’t. This misconception puts students on false career tracks that don’t take advantage of their potential… in contemporary workplaces, we don’t bring lone geniuses together to solve complex problems, we bring teams of people together to solve problems. If we think of creativity in terms of ideas rather than individuals, we open up the possibility for multiple people with many abilities and perspectives to participate in the creative process. Reframing our understanding of creativity as a social and distributed process, Clapp argues, is a necessary first step in ensuring that a greater number of students can access creative learning experiences and develop their creativity. Given MCC’s commitment to ensuring that a greater number of our young people have access to creative youth development opportunities, we’re excited by this line of thinking and how participatory approaches to creativity may increase equity throughout the field of creative youth development. Does this idea of a Participatory Understanding of Creativity resonate with you/your work?